Some movies I just don’t get. I see the trailers, browse the ads, check out the internet scuttlebutt, and by the time I finally get around to seeing some of these movies, I’m left speechless, wondering what in the world the big deal was. A Prairie Home Companion is one of these. I lived in Minnesota for five years (ten if you count the first five years of my life too, which I do, but not when considering pop culture awareness) and grew to develop a fondness for Minnesota culture: their love for the outdoors, their friendliness, their practicality, and their sense of Norwegian history. 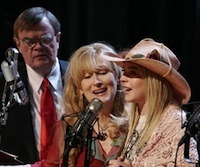 However, for whatever reason, I never listened to a full episode of Garrison Keillor’s weekly radio show A Prairie Home Companion. Through the snippets I have heard over the years, it seems to be a variety show centered on Minnesota culture, with frequent references to a fictional Lake Woebegon and heaping with nostalgia for a time when people actually sat in their living rooms and listened to radio shows like this one. And so it is. While the messages are nice, the presentation needs work. But then, perhaps Altman, a celebrated director in what turned out to be the final movie of his career, was simply looking back on life through his camera lens and letting the very talented actors in this movie show us what it means to have endings brought upon us. Perhaps the best part of the whole movie was the very end, when Lola Johnson, played surprisingly well by Lindsay Lohan, joins the cast of the radio show at Mickey’s Diner several years after their show has ended, and offers some forthright and rather unsolicited financial advice to her mother. We see in her mother’s confusion that life has moved on, and some things were meant to end. Perhaps Altman knew this too.